DIE Mercurii, videlicet, 18 die Maii. 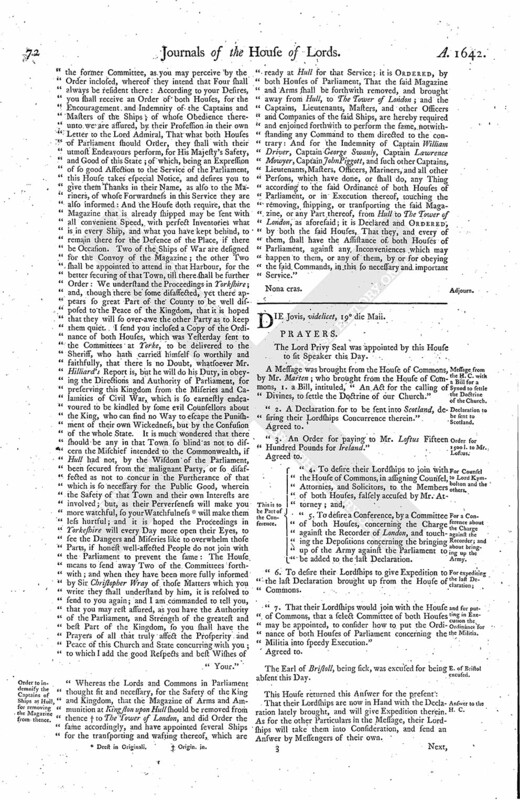 E. of Sussex's Verdict in the Common Pleas to be viewed. Letter from Hull, that the Captains of Ships there, employed to bring away the Magazine, had received a Warrant from the King, not to move it. Ellis Nicholls, apprehended in Cornwall, suspected to be Mr. O'Neale, sent for. Babb and Trelawny, in Error. The Letter from the Captains of Ships at Hull. Message to the H. C. with this and the King's Warrant, &c.
Henry Stamford and Family Leave to travel. Declaration from the H. C.
Message from the H. C. for a Conference about the Letter from Hull, &c.
Sir James Levingston concerning Sutton Marsh. Brough and Manwood sent for, for scandalous Reports of the Lord Lieutenant of Ireland. Conference about Letters from Hull reported. Committees to be sent to Hull. Message to the H. C. that the Lords agree to the Letter and Order. Lord Morley and Captain Kirke. Letter to Sir John Hotham. 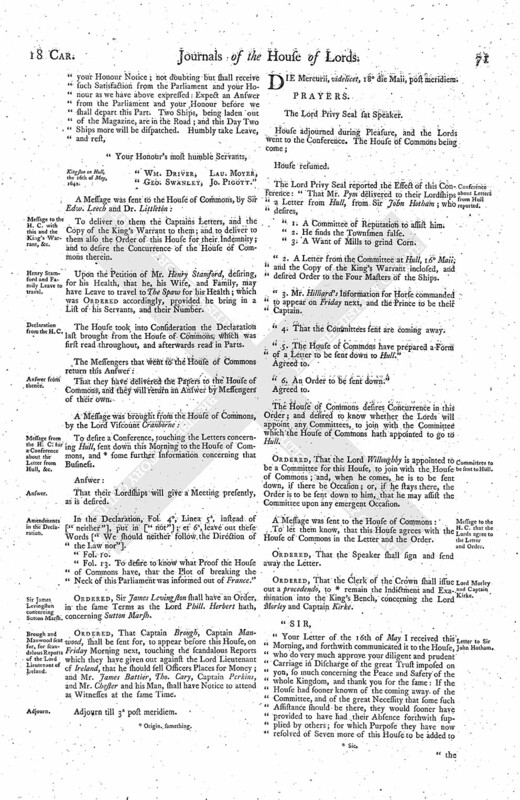 Order to indemnify the Captains of Ships at Hull, for removing the Magazine from thence. Ordered, That Mr. Justice Foster shall view the Verdict made of the Earl of Sussex, made in the Court of Common Pleas, to see what is passed by that Verdict, and report the same to this House; and that, in the mean Time, the Possession of the Earl of Sussex is to be preserved. The Lord Keeper is excused for his Absence, in regard of his Health. The Lord Admiral signified to this House, "That he hath received a Letter from Hull, from some Captains of Ships which are in that River upon the Service of the Parliament, in bringing away the Magazine; and they have received a Command from the King, dated at Yorke the 10th of May, upon Allegiance, not to suffer or put aboard any of His Magazines, &c.
"They desire their Lordships to take some Course for their Indemnity in obeying the Commands of this House." Trusty and Well-beloved, We greet you well. Whereas We are informed, That, under Colour of Our Service, there is an Intention, or Practice, contrary to Our Command, and without Our Consent, to put aboard some of Our own or of Our Subjects Ships, Our Arms and Ammunition [ (fn. 1) which, by] Order from Us, was long since laid up in a Magazine in Our Town of Hull; We do therefore hereby expressly will and command you, and every of you, upon your (fn. 2) Allegiance, not to suffer all or any Part of Our said Arms or Ammunition to be laden or put aboard any of Our own or any other Ship or Vessel, at or near Hull, under any Pretence whatsoever, or by any Order, Instructions, or Warrant whatsoever, other than an especial Warrant under Our Royal Hand: And We not only require you to publish and make known this Our express Command to all the Captains, Masters, Officers, and Mariners in Our own and all other Ships or Vessels at or near Hull; but We charge you and them to be very vigilant and careful to obey this Our Commands, as you and they tender the Peace of this Our Kingdom, and will answer to the contrary to your utmost Peril. Given at Our Court at Yorke, the 10th of May, 1642. "To the Admiral, Vice Admiral, Captains of Ships." The Lord Admiral informed this House, "That his Lordship's Vice Admiral in the North of Cornwall hath taken one, under the Name of Ellis Nicholls, who is very like to Mr. O Neale; and, upon Examination, he finds him very peevish, and conceives him to be a very dangerous Person, in case he prove not to be Mr. O Neale:"
Ordered, That the said Ellis Nicholls shall be sent for, to appear before the Lords in Parliament; and that he shall be conveyed up from Sheriff to Sheriff. Ordered, That the Writ of Error between Babb and Trelawny shall be argued in this House on this Day Sevennight. "Our most humble Service, &c. Your Lordship received Advice, from the Honourable Committee of both Houses of Parliament in this Place, of the Arrival of the Ships The Prosperous and Hercules, before this Town, the Second Ditto, whose Packet was sent away before our going ashore, else should not have omitted to have given your Honour speedy Advice of the abovesaid; since which Time, understanding of Captain Strachen being in the Road of Scarborough, dispatched a Post with your Honour's Warrant for his Captain's Place, and Order to repair into The Downes, as also the Earl of Warwick's Warrant to the said Effect, whose Answer here inclosed we send. Kingston on Hull, the 16th of May, 1642. To deliver to them the Captains Letters, and the Copy of the King's Warrant to them; and to deliver to them also the Order of this House for their Indemnity; and to desire the Concurrence of the House of Commons therein. Upon the Petition of Mr. Henry Stamford, desiring, for his Health, that he, his Wife, and Family, may have Leave to travel to The Spaw for his Health; which was Ordered accordingly, provided he bring in a List of his Servants, and their Number. The House took into Consideration the Declaration last brought from the House of Commons, which was first read throughout, and afterwards read in Parts. That they have delivered the Papers to the House of Commons, and they will return an Answer by Messengers of their own. To desire a Conference, touching the Letters concerning Hull, sent down this Morning to the House of Commons, and (fn. 3) some further Information concerning that Business. That their Lordships will give a Meeting presently, as is desired. In the Declaration, Fol. 4°, Linea 5a, instead of ["neither"], put in ["not"]; et 6a, leave out these Words ["We should neither follow the Direction of the Law nor"]. Fol. 13. To desire to know what Proof the House of Commons have, that the Plot of breaking the Neck of this Parliament was informed out of France." Ordered, Sir James Levingston shall have an Order, in the same Terms as the Lord Phill. Herbert hath, concerning Sutton Marsh. Ordered, That Captain Brough, Captain Manwood, shall be sent for, to appear before this House, on Friday Morning next, touching the scandalous Reports which they have given out against the Lord Lieutenant of Ireland, that he should sell Officers Places for Money; and Mr. James Battier, Tho. Cary, Captain Perkins, and Mr. Chester and his Man, shall have Notice to attend as Witnesses at the same Time. Adjourn till 3a post meridiem. The Lord Privy Seal sat Speaker. "1. A Committee of Reputation to assist him. 2. He finds the Townsmen false. "3. A Want of Mills to grind Corn. "2. A Letter from the Committee at Hull, 16 Maii, and the Copy of the King's Warrant inclosed, and desired Order to the Four Masters of the Ships. "3. Mr. Hilliard's Information for House commanded to appear on Friday next, and the Prince to be their Captain. "4. That the Committees sent are coming away. "5. The House of Commons have prepared a Form of a Letter to be sent down to Hull." "6. An Order to be sent down." The House of Commons desires Concurrence in this Order; and desired to know whether the Lords will appoint any Committees, to join with the Committee which the House of Commons hath appointed to go to Hull. 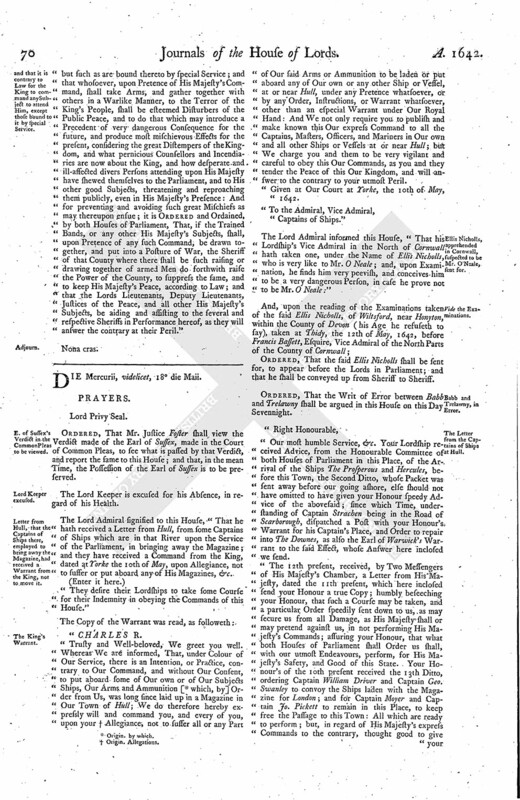 Ordered, That the Lord Willoughby is appointed to be a Committee for this House, to join with the House of Commons; and, when he comes, he is to be sent down, if there be Occasion; or, if he stays there, the Order is to be sent down to him, that he may assist the Committee upon any emergent Occasion. To let them know, that this House agrees with the House of Commons in the Letter and the Order. Ordered, That the Speaker shall sign and send away the Letter. Ordered, That the Clerk of the Crown shall issue out a procedendo, to (fn. 4) remain the Indictment and Examination into the King's Bench, concerning the Lord Morley and Captain Kirke. Whereas the Lords and Commons in Parliament thought fit and necessary, for the Safety of the King and Kingdom, that the Magazine of Arms and Ammunition at Kingston upon Hull should be removed from thence (fn. 6) to The Tower of London, and did Order the same accordingly, and have appointed several Ships for the transporting and wasting thereof, which are ready at Hull for that Service; it is Ordered, by both Houses of Parliament, That the said Magazine and Arms shall be forthwith removed, and brought away from Hull, to The Tower of London; and the Captains, Lieutenants, Masters, and other Officers and Companies of the said Ships, are hereby required and enjoined forthwith to perform the same, notwithstanding any Command to them directed to the contrary: And for the Indemnity of Captain William Driver, Captain George Swanly, Captain Lawrence Mowyer, Captain John Piggott, and such other Captains, Lieutenants, Masters, Officers, Mariners, and all other Persons, which have done, or shall do, any Thing according to the said Ordinance of both Houses of Parliament, or in Execution thereof, touching the removing, shipping, or transporting the said Magazine, or any Part thereof, from Hull to The Tower of London, as aforesaid; it is Declared and Ordered, by both the said Houses, That they, and every of them, shall have the Assistance of both Houses of Parliament, against any Inconveniences which may happen to them, or any of them, by or for obeying the said Commands, in this so necessary and important Service."